Because the Segway PT is so practical in a wide variety of situations, we’ve had people looking for specific accessories that would enable them to utilize the Segway PT in their unique working environment. When what they’ve needed was not available, we accepted the task of working with them to create exactly what they had in mind. 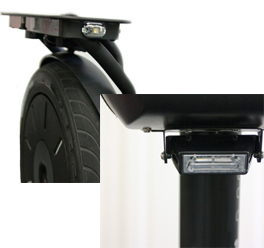 Being Segway PT experts, we can design an accessory that does not compromise the specifications set forth by Segway Inc, such as safety factors, weight limits, and structural integrity. If you have a need, we can help you find a solution. Repairs and Service for all Segway PT Models Purchased form your Utah Segway Dealer. If you can’t or don’t want to lift your Segway PT, we will come to you. Our development team works to make all new projects to meet Segway’s specifications and safety standards. Every state in America has at least one specialized National Guard team that responds to any chemical, biological, radiological, or nuclear threat. Officially, they are known as Weapons of Mass Destruction-Civil Support Teams and through the chain of command are ultimately answerable to the Governor. Many times they work hand-in-hand with local fire departments, which typically are first on scene. LTC Tyler Smith, commander of the 85th WMD-CST, decided the unit needed a faster, better way to run equipment back and forth from command to the hazardous zone and to continually monitor the perimeter – all without using up valuable oxygen which lessens the time they can spend in their suits. When he came to us wanting to try out the Segway PT, he expressed the need for an accessory that did not yet exist. With the unit’s needs in mind, we created the StreetSmart® Tray, with 11 wide angle white lights that facilitate getting into dark places like tunnels or warehouses when electricity is off, plus it’s capable of carrying all their necessary equipment. They have used their Segway PTs with the StreetSmart® Tray in several training exercises and have consistently proven that they can drastically reduce the time it takes to control and neutralize a dangerous situation, thus increasing the effectiveness of their team. Our patented StreetSmart®Components for Public Safety led people to ask for a lighting system available for the general public. We scaled down what we already had to create the StreetSmart® Safety Lighting System to give you super bright white front riding lights and flashing red tail lights. The Segway hard cases are perfect for some conditions, but because they hang over the cargo plates, it makes it a bit tough going through certain doorways so people asked for another option. They wanted something small and compact with some flexibility in the compartments. The StreetSmart® Soft Side Cargo Bag is water resistant and zips fully closed with a heavy-duty zipper. 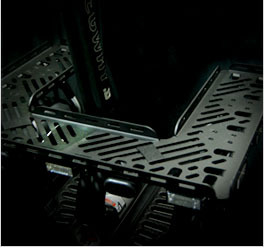 It fits perfectly on the Segway® Universal Cargo Plate without overhang, making it no problem going through doors. 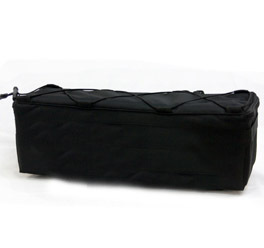 The inside is fully lined with Velcro compatible fabric and has an adjustable inside divider, or you can remove it entirely for one large compartment. The outside front has flat zippered pockets for pens or business cards. The bungee on the top can easily hold your jacket should the weather change. EMS teams all across the country respond to special events in their towns and cities. Many utilize the Segway PT in their response plans but all the med bags on the market didn’t fit the Segway hard cases…so we created some that did. Made of 600 denier waterproof polyduck with a sturdy #10 self-healing double-headed zipper, these bags were designed with incredible versatility and fit perfectly inside the Segway® Hard Cases. The interior is fully lined with Velcro-compatible fabric and comes with 6 color-coded pouches with Velcro on the bottom for securely attaching to the inside of the bag and a double-polished vinyl top allowing clear, rapid recognition of equipment and supplies. The RED Med Bag also has a 12” x 4” x 2 ½” additional pouch that can be securely attached to the inside top of the Segway® Hard Case with the included industrial strength 2” Velcro. 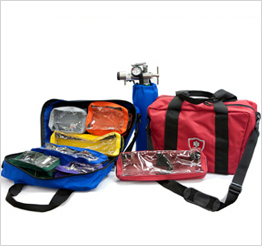 The BLUE Med Bag comes with a sleeve containing an aluminum oxygen cylinder with toggle valve and brass 0-25 lpm regulator. All Med Bags have pharmaceutical lock capability.